File Types: ZIP,PDF,All Files; File Size: 75.54 MB; Columns: 1; Min Browser: IE 8+Firefox 14+Chrome 19+Safari 5.1+Opera 12+. 3 pre-defined color styles. All colors are easily customizable from the Sparky options (infinite color options as possible). 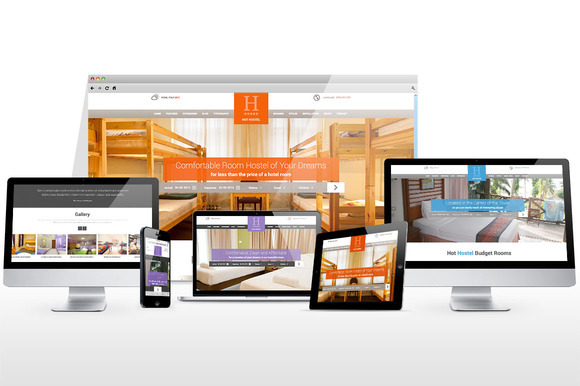 Responsive Joomla modules included: Hot Full Carousel, Hot Elastic Slider, Hot Slicebox, Hot Film Tape and Hot Maps modules are included with Hot Hostel responsive template. All commercial modules included in the Joomla hostel template are free for you, if you buy template (you save $15 per module). This template also includes free version of J-HotelReservation component for reservations and free version of AcyMailer component for newsletters. All extensions are styled and configured for using with this template. 18 module positions are used in our demo. Unlimited number of module positions can be added easily within Layout Editor of Sparky Framework, if needed. Top menu with drop-down sub-levels is divided in two symmetrically positioned menus. Both top menus convert into a button for easier navigation on the mobile devices. Tested with Chrome, Firefox, IE8+, Safari and Opera. Tested on iOS and Android mobile devices. Support for RTL (right-to-left) languages. Keywords: joomla, responsive, joomla template, hostel, reservation, hotel, tourism, vacation, slider, html5, css3, weather, multilanguage.